I know there's an issue with Cedega right now, but it seems the completely free alternative, WINE, has Starscape working. 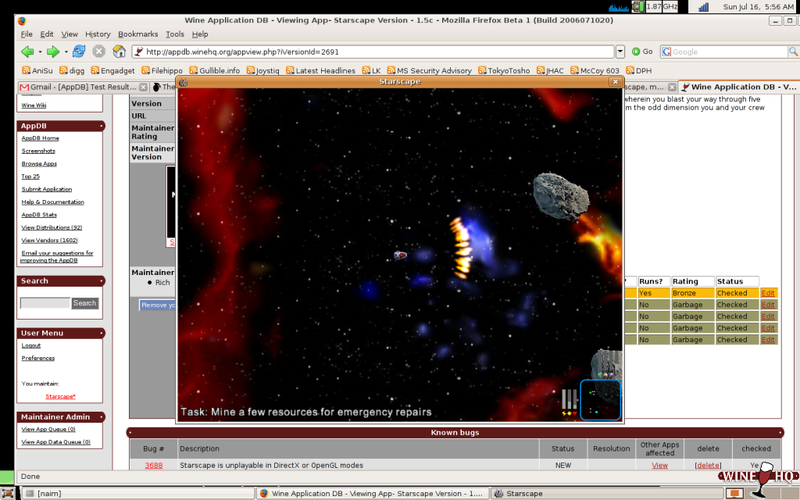 WineHQ is reporting Starscape installs and runs on version 0.9.17 or later (July 16th 2006). Interestingly, I've heard a few people are now using Wine on Macos on Intel boxes, so it may even be possible to run Starscape on a Mac using this method . I think mouse support may still be lacking, but since Starscape was designed originally to be fully pad/key controlled, it should be only a minor annoyance, and won't stop the game being played to completion. We are going to set up a linux box post Mr. Robot's release, so I'll try it then if nobody else has the chance. All hail the mighty Wine programming team. I was under the impression that anything ATI > nVidia. If memory serves, the open source (linux) ATI drivers were either very close to or on par with the regular (windows) drivers. I experienced a number of problems (odd graphics glitches, full out crashes) with the "latest" driver available for my nVidia card. I also only tried a single, not very popular distrobution, so it might have been my fault more than the card's. I think this is the first time that i have heard someone saying that ATI is better than nVidia. NVidia releases their own Linux Drivers for these supported cards. Get all your questions answered by ATI and Intel. 3dLabs provides various drivers for Redhat, Suse, and Novell Linux. XGI also provides support on Redhat and SuSE, but not for their newest cards. VIA at least supports Mandriva and Fedora along with SuSE, Redhat, Mac, and even a non-linux-specific driver section, and source! If you set up a fedora core box, be sure to enable the livna repo to get the proprietary drivers (for both ati and nvidia) through yum. 3d acceleration in particular suffers without them. edit: I just tried it myself - You have to run it in opengl and windowed mode, and it'll screw with your graphics a bit, but it works. The mouse behaves really funky. 1. ATI has some nice All-In-Wounder cards if you didn't want to buy 501 different parts to do what it can in one. It's a fair brand too. 2. For gaming though I'm all about NVidia, it's a dedicated card with fewer things to go wrong and more power devoted to the one thing a gamer wants it their video card to do, look pretty. More over it's easy to use and update. 3. ATI has well earned it's nickname, Automatic Trouble Installing. Also Nvidia is clearly way better for anything Linux related, since they put out their own drivers that actually work properly with no hassle. If you like jacking off to big numbers use ATI. If you want to play games and have them work use nVidia. And if you like being confused, try throwing a little philosophy into the mix. While nVidia's proprietary linux drivers are better than ATI's, the free software community has developed better open source ATI drivers because ATI's cards are better documented (or so I've been lead to believe). The difference is definitely splitting hairs, since both vendors' open source support is pretty bad, but if you're a free software purist ATI's the way to go. It doesn't really help that ATI's drivers are open source if they don't work correctly Pretty much everyone on the Ubuntu forums tells you to get an Nvidia card because ATIs simply can't do a lot of things without hours of hacking, and sometimes not even then. If they open-sourced the drivers then maybe we'd see some improvement, but for now get Nvidia if you intend to do any gaming or heavy 3d graphics on a Linux box. If you're a free software purist, you're not a Moonpod customer. (There are very few OSS games. The only one I think is worth bothering with is Wesnoth, which I gave up on because it was too hard).